Way back with webOS 1.3.1 we got a surprise: the ability to set apps as a default app, letting you use third party apps as your default launcher, mapper, email, and the like. Only problem was, Palm and HP never got around to actually making the API for this public, so any app developers that included the code to allow their app to be listed as a potential default was denied access to the App Catalog. That's a shame, considering there are a lot of apps that could have stood to have been nominated the default app in place of what was built-in on webOS. In fact, we'd imagine that the lack of default app support probably held back some development - why bother making a browser for a small platform like webOS if users can't even set things such that links automatically open it your app instead of the default one? Granted, that didn't stop homebrewers, but they shouldn't have had that roadblock in the first place - especially with a feature whose groundwork was so publicly outed in the Launcher app menu way back in 2009. All we ever officially got? The ability to choose between Maps (be it the original Google or the replacement Bing) and a built-in carrier-driven navigation app if there were one. There are several replacement mapping apps in the App Catalog. There have been replacement browsers. There could be replacement email apps. The Google Voice apps could stand to intercept phone numbers and dial directly through the service. But that's not possible so long as the Default Applications option is locked down, but still peaking around the corner and taunting us with greyed-out options. When your webOS device is set to vibrate-only and a notification comes in, be it a text message, email, or app alert, there is usually no way to distinguish what that alert is for unless you physically look at your phone. There have been patches in the past that changed the length of the messaging vibration alert to a longer preset length, but now you can install a Tweaks-enabled patch that not only allows you to not only set the length of the vibration, but you can also set a vibration pattern. Once you install the "SMS Vibrate" patch by webOS forum member nickpl, just load up Tweaks and go to the Messaging section. 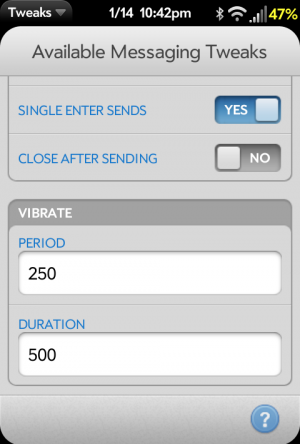 There should be a new VIBRATE section with two options. DURATION: The total duration time of the vibration pattern. Note that this patch has only been tested on webOS 2.2.4 and may not be available on earlier versions. It is important to note that this currently performs a case sensitive search of the titles of the media, not the filename itself. We have been told that this will be enhanced in a coming update to also allow searches of the filenames and remove the case-sensitivity. Finally, there is an OPTIONS section you can set the sort order and also determine if you want to include any podcast file downloaded by GuttenPodder or keep the default to exclude those files. From here, you can listen to any of those files just as you would any other podcast. 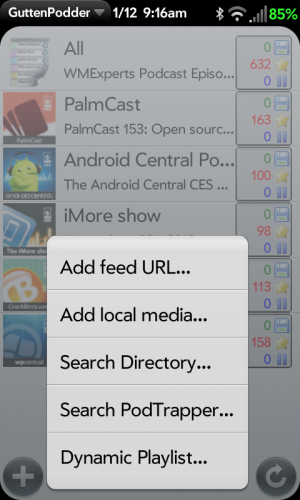 You can even add the same audio file to any number of local media feeds, not just a single one. 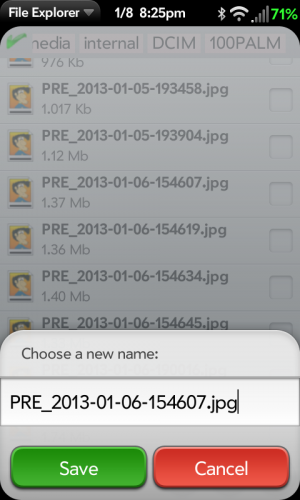 Have you added additional files to your device after you set up the feed? Just tap the refresh button again and GuttenPodder will add in those new files. And don't worry about deleting files from the app. Although it appears as if you can delete a file, this only marks it as read within the app; no local file will be deleted by GuttenPodder. So there you have it? You can now use GuttenPodder as a music player, audiobook reader, or just an app to organize your media. Announcing CrackBerry's BlackBerry 10 Launch Campaign Headquarters! 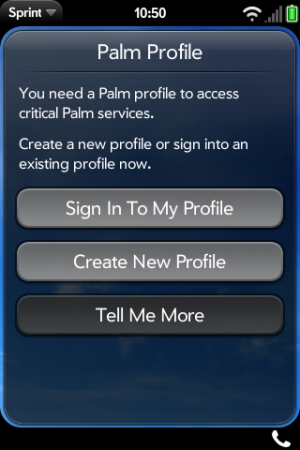 One of the most frequently requested features for webOS phones has to be the ability to simultaneously activate your Palm Profile on multiple devices and swap between phones as necessary. This ability was added to webOS 3.0 on the TouchPad, but does not exist for webOS phones. So, if you were ever to activate an existing Profile on a second webOS phone, it will send a wipe command to the original phone and you need to re-activate it from scratch when you want to return to that first phone. You can use some homebrew trickery to prevent the phone from performing a total wipe of the device by removing your profile from it, but what happens if you want to go back to that phone later on? Having to perform a full activation of the device is not a good answer. Thanks to the geniuses as WebOS Internals, you can use those steps mentioned above to prevent your device from being wiped, and then extende it to activate your Profile on multiple devices without requiring the need to erase and re-setup your phones each time you need to swap. It may not be the most elegant solution, but it works, albeit with a few caveats that you should review below. In order to swap profiles between devices, you will need to have the homebrew app Impostah installed on your device and take advantage of two previous PreCentral tips: Bypass Activation [webOS 2.x] and the aforementioned Prevent device wipe when activating another phone. Continue after the break for directions on how to set up your devices and swap your profile between them. I've spent the entirety of this week in Las Vegas with the Mobile Nations crew covering CES 2013. CES has a special place in the hearts of webOS fans - after all, it was CES 2009 where the Palm Pre was unveiled to overwhelming critical acclaim, and CES 2010 saw the announcement of the Palm Pre Plus and Pixi Plus. Even after the debacle of the webOS hardware development cancellation, CES 2012 had OpenMobile showing off their intentions to bring Android apps to webOS. CES 2013, on the other hand, was entirely devoid of webOS. It's understandable, though I was surprised that HP didn't even have a space on the show floor (to call what Samsung, Sony, and the others are doing 'booths' would be to call Godzilla a salamander). Then again, Microsoft doesn't have an official presence at CES anymore either. OpenMobile was at CES this year, and this year they were focusing on building yet another Android app store - one that has nothing to do with webOS. My thanks to Android Central's Alex Dobie for helping with filming. The story of what happened to HP is a complicated and at times a depressing narrative. Things were going okay until 2010, when CEO Mark Hurd was forced out of his leadership position due to sexytime-driven accounting improprieties. That kicked off the era of Leo Apotheker, a disaster on all fronts for HP and webOS. It's been known for a while that late Apple founder and CEO Steve Jobs was a fan of HP as a Silicon Valley institution, and today Businessweek published an extensive piece on HP's fall from grace that included a fascinating nugget: despite HP being a competitor on many fronts with Apple, Jobs personally urged Hurd to reconcile with HP. Jobs went so far as to personally email Hurd within a few days of his departure, asking if he "needed someone to talk to" (Jobs had gone through a similar ouster, though with less sexytimes, from Apple decades earlier). "Hurd met Jobs at his home in Palo Alto, according to people who know both men but did not wish to be identified, compromising a personal confidence. The pair spent more than two hours together, Jobs taking Hurd on his customary walk around the tree-lined neighborhood. At numerous points during their conversation, Jobs pleaded with Hurd to do whatever it took to set things right with the board so that Hurd could return. Jobs even offered to write a letter to HP’s directors and to call them up one by one." Of course, Jobs's motives in talking to Hurd and attempting to smooth the ruffled feathers of HP's board wasn't entirely personal. Jobs believed that a healthy HP was "essential to a healthy Silicon Valley," with HP essentially standing as the founding company of California's technology hotbed. Of course, Jobs was not able to bring Hurd and HP's board back together, and in things unraveled very quickly with the questionable selection of former SAP CEO Leo Apotheker as HP's new chief executive. How different things would have been under Hurd is hard to say, but it's all but certain that webOS would have been given the time and the money it needed to succeed. When you connect your webOS device to a computer, you have the option of entering USB mode to view or edit all the files on your device. You can copy, delete, rename or move around files all you want, but sometimes you don't have a computer nearby when you want to edit your files directly on your device. Whether you have a webOS phone or a TouchPad, there are a number of great file manager applications available to you that will allow you to edit your files. For the cases where you want to rename a file on your device, the steps are a little different depending on the app you are using. Find the file that you want to rename and tap on it, or find a folder that you want to rename and press-and-hold on it. A pop-up will appear and select "Info". Type in your desired new name and press Enter. A pop-up will appear asking you to confirm the new name. Select "Yes"
Internalz is available in the webOS App Catalog for $3.99, while Internalz Pro is available in the webOS Nation homebrew app gallery for free. Find the file that you want to rename and tap on it, or find a folder that you want to rename and press-and-hold on it. A pop-up will appear and select "Rename". Over the years we’ve witnessed all kinds of webOS and Android hacking madness. From Android riding shotgun with webOS on a dual-booted TouchPad to Open webOS being fired up on a Galaxy Nexus we have seen all sorts of interesting ways of joining the two operating systems under one proverbial roof. One of the interesting things to come out of webOS going open-source with Open webOS is Phoenix International Communication’s project to get Open webOS running inside Android as an app. However, what if someone did the opposite and booted Android as an app within webOS? Well that is what Russian developer Nizov Nikolay has accomplished with AndroidChroot. From Nizov’s video posted on YouTube we can see he has successfully booted CyanogenMod 7 onto his Pre 3 as an app within the confines of webOS. Unfortunately being in the alpha state that it is it seems more than a little sluggish and there don't appear to be any of the default Google Apps loaded (no Google Play Store or Google Services). But even without Google services there are plenty of other ways to procure awesome Android apps, like Amazon’s App Store. There's a lot of optimization to be done before you'll want to run any of those apps, so think of this as more of a proof-of-concept project for the time being. Nizov's project is definitely one we will be keeping an eye on - if it gets running at acceptable speeds it could be an optimtimal solution for the Pre3 lovers among us. Sure, there's the possibility that Open Mobile might someday give use the ability to run Android apps in webOS like they said they would, but why use just the apps when you can use the whole Android operating system? Just something to wrap your brains around for a moment there. In the meantime sit back and watch this pretty cool YouTube video of Nizov Nikolay's Pre 3 taking part in some Android loving awesomeness.